Most athletes train in strict windows of opportunity scheduled around work and family. Coaching allows me the flexibility to adjust my plans, training as and when I need. It has its drawbacks and requires self-discipline; I can’t endlessly postpone workouts and pick favourite sessions over the plan, though sometimes I cross that line. My plans aren’t as rigidly defined as those of my athletes; I rely more on weekly objectives and key sessions. A time constrained age grouper follows their plan like a timetable; if a threshold session is scheduled for Wednesday evening that’s when it happens, whatever their condition. If they’re off form then they’ll under perform, but that will be the week’s threshold work. In Monday’s blog I discussed how we can’t expect to always be at our best, but it’s important to always aim for goal performances. My week involves a mix of sessions with differing goals. Having broad windows of opportunity for training means if I feel unable to perform a key session I can postpone it. The week is fluid and I focus on ensuring key workouts are performed well over when they’re performed. If it isn’t happening I may have an easier ride, a swim, a run or perhaps take more rest. Everyone shuffles their schedule. 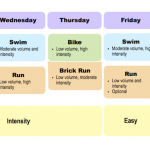 I build training plans attempting to optimally time workouts and ensure they are performed as intended, but I don’t know what will happen in a fortnight. An athlete could be overloaded with work, sick or even injured; in each case the plans change. Sometimes it’s minor adjustments – swimming a day later or losing an easy run; other times it takes major rearrangements – accommodating a business trip or pool closure. However tight our schedule, flexibility is part of consistent training. 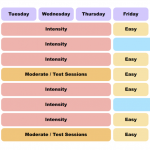 Weekly schedules are the micro level, the building blocks of our fitness. No individual session determines the success of our plans, their cumulative effect builds towards the goals. To be flexible you have to appreciate the macro level, the intent of your training. Understanding those intentions and what you’re working towards enables you to prioritise. You have to know why you’re doing a session before you can decide if you move it or drop it completely. One of my athletes provided a good example: an FTP test was scheduled for the middle of the week, but on the day he felt exhausted. He’s a strong individual and training well, we were both confident of a notable improvement since his last test. 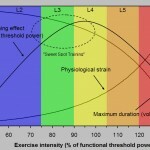 Being that fatigued was unusual and an indication there was too much training leading to the test. He rescheduled for the following day and a new, higher FTP was set. 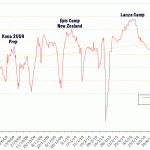 The week’s priority was measuring bike performance so the schedule was adjusted to meet that goal. As a counter example, I’d arranged to train with a number of the athletes I coach; my usually flexible routine was constrained. Tuesday’s long ride was tough leaving me with considerable fatigue. In normal circumstances I’d postpone Wednesday’s interval session for a better performance, but with commitments to others they went ahead. The session was good, I worked hard, but under performed failing to reach my power targets. Cycling is my priority, but with training going well the individual session wasn’t so important I needed to move it. Flexibility is good in moderation. The ability to adjust plans and perform key sessions at your best can boost performance, but misused it hinders progress. Before moving a session consider the implications – you’re not only moving the benefits you’re moving the recovery time as well. Postponing an interval set by a day could leave you tired for a long run the day after. What’s the priority? Would it be better to under perform today and run better later? The worst mistake is considering the week in isolation – viewing the schedule as a checklist. A workout that’s missed or under performed is revisited later in the week; before long the weekend is stacked. You cannot catch up, something has to give. You may complete the week, but you’ve carried the recovery into the following one. Again you need to consider the priorities. Would it be better to miss a session this week so you perform better next? Plans change. There are no hard rules to being flexible. If anything I find most athletes tend to focus on completing every session and not enough on how well they complete them or how well they recover. If they don’t squeeze everything in they feel guilty. Flexibility should never compromise the goals. Progress comes from consistently performing key sessions well, that takes a little flexibility.